We have some cool musicians on Stish and this is the category they use to share stories about music and their latest works. ‘Free Your Mind’ is a dance track that David had created and sent over to me this past Sunday. I quickly got to work on writing some lyrics and recording the vocals with added 3 part harmonies for the finished track. This really is so far detached from my usual ‘Folk/Indie style but, I’m finding a whole new range in my Vocals! I hope you enjoy this track. Myself and David Far would to thank everyone for their kind support for our new music project! ‘Time’ is a song that I wrote a few years ago, whilst struggling with the emotions left behind by my estranged mother. She walked out on me and my sister, and left my dad to bring us up single handedly. It’s a song of hope and happiness, and getting through the hard times that some of us experience. After all, that’s what life is all about, experiences and tears of joy and laughter. My guitar is a Crafter TA050 Electro Acoustic. I hope you enjoyed this song! Darren Claxton is a Songwriter, Musician and Producer of his own music, from Derbyshire UK. The music he writes is often heartfelt acoustic indie folk with a sprinkling of rock and country influences, with an occasional world music flavour as heard on his track ‘Dragonfly’ . But most of all, it’s his passive emotive thoughts and feelings that are delivered through that soothing vocal, and intricate guitar playing of his. Choon is a music streaming service and digital payments ecosystem—designed to solve the music industry’s most fundamental problems. My Producer, friend and Broken Ocean songwriting partner David Far is now offering his Production and Mastering services for your next music release. David has an impressive set of musical skills coupled with extensive knowledge of DAWs and Computer recording. He has, to date, worked with numerous artists from around the globe online and produced music of all genres and unique styles. We met on Steemit and Discord last summer and promised to work together on a new collaboration track and mix our skills. He’s also a great musiciwn and songwriter in his own right, so this was an easy decision for me to make. My New EP Little Words was produced by David too! I’m fairly new to the whole computer recording thing, but David made this process very easy by talking me through the process. We used Google Drive to share stems as it’s one of the quickest and easiest ways in which to share such large files. 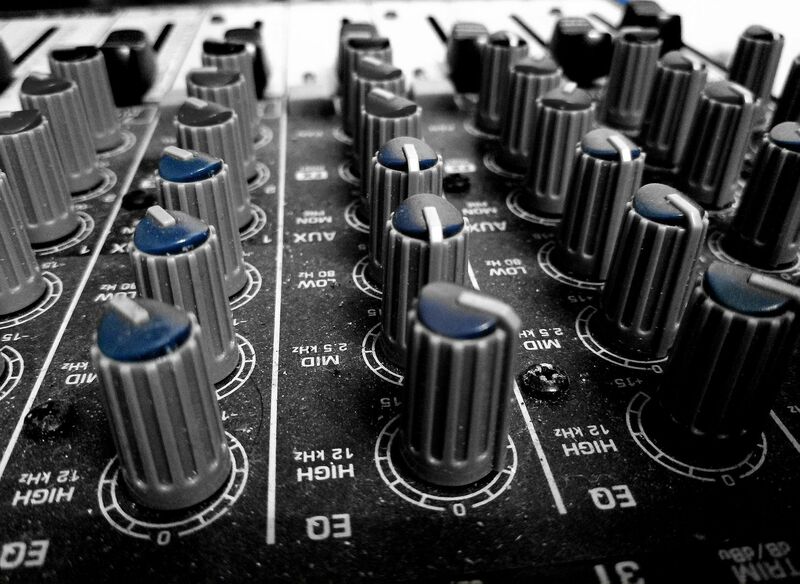 Thanks for taking the time to read my post and be sure to reach out to David if you need any production or mastering! You won’t be disappointed! https://dsound.audio/#!/@darrenclaxton/20190209t111039926z-ive-been-good-original-song-by-darren-claxtonGood morning, afternoon and evening from me in England! Here’s my song I’ve Been Goodwhich is all about being young, drunk, having a great time playing in bands and looking for love. This song has so many dynamics and power, that I was really struggling with my limited production and mastering skills, So, I messaged by Broken Ocean partner @davidfarand asked him to work his magic, and did he ever? I am so so proud of this track and can’t thank @davidfar enough for his time, effort, knowledge and wizardry in his home studio. Thanks for your continued support and kind words for me and my music! Little Words EP OUT NOW! Here’s my song Little Words which is the title track from my new EP – Out Now on ALL major download stores! You can now download my new EP ‘Little Words’ from Amazon, Spotify, Google Play, iTunes and Many others! Thanks especially to @d-vine and @davoodfaramarzi for inspiring me to carry on releasing music! LITTLE WORDS is my brand new 5 track EP, which will be released and available to buy from all major download stores on January 6th 2019. Here’s a remix of my song YOUR PLAN which has been magically reworked and enhanced by my songwriting partner and Broken Ocean team mate DAVID FAR. He added Cello, War drums and some subtle guitar parts, which has really enhanced the whole feel of this simplistic but haunting track. David’s production skills are always worth a mention as they just finish everything off beautifully. Maybe your eyes, they show pain. I hope you enjoyed this track! Thanks for listening, voting and commenting! Your support means so much to me! Thorny Waves – From the new EP ‘LITTLE WORDS’ – Coming Soon!! The picture is one of my rare hand drawn pieces. It’s nice to be important But it’s important to be nice. Hello all! here’s an instrumental track of mine titled ESCAPISM which was written quite a few years ago now. I revisited the track and re-recorded it as I think it’s a really moody, mysterious and frankly spooky sounding creation. All the instruments were played by me which gives it that real organic sound. Escapism – is my next instrumental track upload for Choon. As you know, I write many songs and play on MSP waves radio quite regularly and also co-host a weekly show ‘Spotlight On The Artist’ but there are other sides to my musical creativity, and that lies in my instrumental creations. When I began to compose and create music back in the early 00’s, I didn’t really know that I could sing, so just constructed instrumental moody music. This track developed over a few weeks and just grew and grew. It was constructed from the bare bones of that hypnotic beat and bass line that you hear. I created the drums and bass riff using real instruments, played in real time to a click track. I also use the built in pads on my vintage ZOOM Porta Studio Recorder and play finger drums this way, which creates that natural flow, which hovers underneath the haunting lead guitar and synth pads. Please feel free to comment, vote and share as you wish, as this really inspires me to produce more and more music. Thanks! Thorny Waves – Sketch Animation Video by @junkfeathers – Music by Darren Claxton + Get some DCMUSIC tokens! Here’s an incredible sketch animation video which was created for me by a very talented fellow musician from America. This is what Junk Feathers had to say about the animation. I hope you all enjoy this video and please be sure to visit @junkfeathers and show him some appreciation and please subscribe to my channel and share share share! Wanna get your paws on some DCMUSIC tokens so you can get a nice up-vote on your Whaleshares Posts? I really think it deserves more recognition and to also show everyone how talented my good friend @junkfeathers is! If you complete all 4 of these tasks I’ll send you 100 DCMUSIC to your Bitshares account which you can use to reward your latest post. There’s a bonus of 100 DCMUSIC for any extra places you share it too! And finally, please comment on this post with your Bitshares name so I can send you the tokens. Check out the Brand New Music Video from Darren Claxton! I wrote ‘Waiting on a Raincloud one bright spring morning back in March/April, whilst eating breakfast! As I looked out onto the garden, I saw birds feeding, bees flying and plants growing! Here in England six weeks prior to this, it was a bitter -5c and bitterly cold. This song is to remind us all of how beautiful nature and our planet really is. You can find my music at the following places! Here’s my rendition of this classic track by BB KING. He was one of my biggest influences musically and I still love listening to his old recordings. I recorded it the day BB died – May 14, 2015. Inside Your Soul was written at the height of my breakdown, depression and anxiety back in 2013/14. It stayed on the pages in my book of stories (Lyric book) and never emerged until earlier this year. There are many songs in that book that still need to see the light of day, but I’ll hopefully get round to recording as my Whaleshares, Steemit, and Choon Journey continues. I hope you find some enlightenment, and can somehow find a connection to this song of mine. Please do remember, someone is always ready to listen and help, so please don’t suffer in silence if you’re experiencing mental health issues! YOU’RE NOT ALONE! 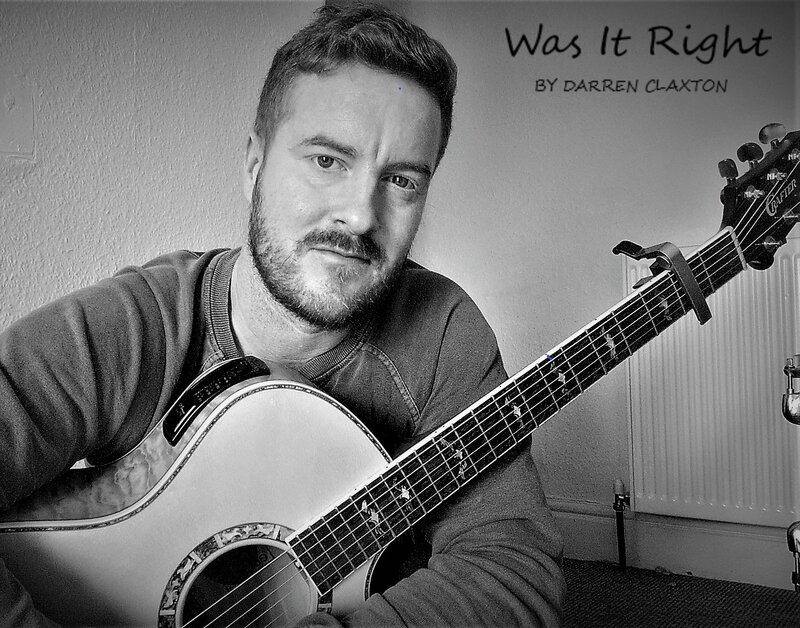 Darren Claxton is a Songwriter, Musician and Producer of his own music, from Derbyshire UK. The music he writes is often heartfelt acoustic indie folk with a sprinkling of rock and country influences, with an occasional world music flavour as heard on his track ‘Dragonfly’ . But most of all, it’s his passive emotive thoughts and feelings that are delivered through that soothing vocal, and intricate guitar playing of his, as heard on INSIDE YOUR SOUL. And it’s being released exclusively onto CHOON and shared here before anywhere else. Darren says:It all started a few weeks ago when myself and David were talking about the possibility of working together on a collaboration project together. As you know, I’m a busy musician, father and also work full time at a school here in England. So, myself and David were talking in Discord about acoustic guitars and which ones are best etc, this lead onto the subject of creating a song together. David sent me the raw mix of this epic track which was aptly named EPIC. I got the file before driving home from work and listened to it all the way home. I was instantly hooked by the way David had composed the tracks, his use of instruments were much different to my style of writing and his production skills were already prevalent as we’ve all heard his recent work on CHOON STEEMIT and have both worked with/covered Lilly Wilton’smusic. Now, since joining Steemit in early January, I’ve been actively writing and sharing my original music with the world! This has been an amazing and inspirational journey which has re-ignited my passion for music. my crazy besty D-VINE The amazingly gifted Serena Mathews and now, David Far an incredibly talented musician and producer from Iran. They just flowed out of me like a waterfall of emotive thoughts and feelings. The fun started, me and DAWs are foreign to one another, except for ‘Cakewalk by Sonar’ which I’ve been using at school to mix Dubstep and Dance samples with the students. Reaper was engaged and I plugged in my really oldUSB mixer and recently acquired SE2200a condenser mic. This flawless process took a little over 24 hours as we both had to sleep and rejuvenate ourselves! I designed the logo in Word and used some FREE logo making images as to not plagiarise anyone. The name Broken Ocean was created by me a few years ago when I was hoping to form and offshoot of my solo music. As Darren wrote about the Broken Ocean and about how we started this project and team, I skip those parts, I also want to add that in this song, Darren has sing the song so powerful and amazing, which gave the music a life. when we started this project, I saw that we both work motivated on the track and we are not skipping things so fast, as we care about the whole song. The process of the music, after me and Darren started it, we think about each part of it, and sharing ideas to reaching the point that we wanted, as I love to produce musics for Films and Video Games, I tried to make this track to be a soundtrack and in an epic way, making it huge with War Drums and Heavy Piano Keys and Cello parts, an emotional Cello, which Darren perfectly sing those parts which all connected to each other well. in the middle part of the track I recorded a guitar line Arpeggio and after that I recorded 3 lines of guitar playing riff in different styles to add more power to the instruments in the choruses. at the end I mixed and mastered the track with FL Studio DAW, which is my favorite DAW as I always say it’s a user friendly software. as Darren also mentioned about the Photo Cover process I skip a little, so I started with a 3d modeling software called IClone Reallusion, and I worked on a scene to reach the idea, so after hours I created that scene, and exported the characters and importing them in Photoshop to working more on them and making them look more realistic and cinematic. at the beginning of the post you can see the Photo Cover. I created this lyric as a metaphorical way of describing moods and life’s little moments. We ride the waves, sometimes they’re calm, sometimes they’re treacherous and sometimes they’re just downright ‘Thorny’ with spikes of bad feeling and awkwardness thrown in for good measure. Thanks for your ongoing support for me and my music! The beauty of writing your own songs is that, you can reconstruct them, change the mood and totally transform them into a different musical beast altogether! Somehow True has been one of those song that’s been a WIP (work in progress) since 2014. This new version is rough around the edges but is finally somewhere close to what I was hoping for. Spending this amount of time on a song of mine is pretty rare but, I really think this deserved my extra time and love to help it blossom and grow. Thanks for listening and I hope you like it. Thanks for listening and supporting me and my music! ‘The Tale’ is a story about a retired and burnt out musician that finds himself back in the norm. he slowly fades back into life and reminisces about his time on the road. It’s a sad fact that this will happen to possibly 99% of successful musicians on the planet. I’m no statistician, but that’s probably not a bad estimate. I hope you enjoy this acoustic laid back song. Thanks for everyone’s continues support for me and my music! It really is so appreciated! Hello Stishers and welcome to my song ‘Breathe’The real beauty of being a singer-songwriter and musician is that, you get to do whatever you like with the songs you create. BREATHE is a rather simplistic little song but also very intricate in its make up. What inspired me to write this? well, I was thinking (I do a lot of that) about all the stupid mistakes that I’ve made in life, and wouldn’t want my children to do or follow in my footsteps. Thanks for listening to, supporting and commenting on my music posts! Here’s a demo of my new song ‘Thorny Waves’ that I wrote earlier this week! I’ve been in full-time Daddy Day Care mode these past 6 weeks which has been so much fun, but also completely knackering! There’s always a song inside my head and heart, and this is one that’s managed to find it’s way out of my body and onto the trusty Zoom Porta-Studio. It’s funny because I’ve been busting my balls on Steemit to save for some new up to date recording equipment, but the truth of the matter is, I still wouldn’t get time to use it as I have this really annoying thing called A DAY JOB which starts again next Tuesday! Bring on the day when I can be a house-dad and make music while the kids are at school, and my good lady can push her little craft business forward! Anyway, as always, I digress! This new song of mine could be better mixed and produced but, it will just have to suffice because, as much as I adore music, my family are top priority and they won’t be at home forever! Thanks to everyone that has supported me and my musical dream since joining here in January! I’d like to share my brand new song that I wrote this evening! It’s called BREATHE which is a simplistic little song. What inspired me to write this? well, I was thinking (I do a lot of that) about all the stupid mistakes that I’ve made in life, and wouldn’t want my children to follow in my footsteps. I gave them breath in their bodies, but I don’t need it back. they walk the footsteps that I make, just don’t follow me, take a ride upon a wing, just don’t look down on me. I never thought of myself as a poet, but reading back those words really stirred some emotive thoughts in me. I hope you enjoy this little song, many thanks for your support. Here’s a quick drumming video of a funky little rhythm I created on my sons junior kit! As you all know, I’m not one to do covers and usually concentrate on writing my own music. This song by Serena Mathews @paintingangels just took me away to somewhere that I’ve not been for a long time, that place, as a musician which is quite foreign, is total admiration for another fellow creative soul. Now, there are many many great musicians here on Steemit that I love to listen to, but there’s just something magical about Serena’s songwriting that I’m addicted to. I really hope you like what I’ve done with your song ‘Wish Away’ Serena, and will no doubt be speaking to you very soon. I don’t drink and I don’t smoke and I don’t like to cry. I guess that I’ll just wish away this pain. I wish that you still loved me. please don’t linger in my sorrows..
Resolve is a song about my childhood. Myself and little sister were raised my dad, something unheard of back in 1980, when our mother walked out on us all. There is still no reason why she did that, but I’ve not missed having her around because my dad is the GREATEST man I know, and my kids have an amazing mother so that is all I need to hold on to. The people in the photo are me with my son and daughter – my sister also had a son and daughter – beautiful. they stay with us tomorrow, today. Thanks for listening, commenting, voting and supporting me and my music! This track is my dad’s favourite! He’s been begging me to upload this somewhere on the internet for all to hear. It always strikes me how us musicians can write a piece of music, record it and leave it on our hard drives for years without ever sharing it. Something that @edprivat said the other night on SMA Needle On The Record show with @d-vine and @onemedia was – “I’m just gonna upload my music so, f**k it if no one likes it” I really grasped what he was saying, so here’s my F**k it tune for this week! I’d like to start a trend within our little @dsound club and get people to drag out their old long lost tracks that they’ve been hiding away! Thanks as always for listening, supporting and following my musical shenanigans! The rainbow photo was taken by me from our stairs window. They have collectively and ingeniously remixed my track ‘Was It Right’ which has transformed into a beautiful dancing creature glowing with that warm summer sunshine vibe. I am so flattered and impressed by their work that I’m championing them through this post and beyond! If you would like their magic sprinkled over our music, I strongly suggest that you hook up with them. For all you tech heads out there @sevaux and @chiefmappster – here’s what @jeffleinwand and @d-vine magically did to my track. Sent guitar & vocal through the Neve 1073 preamp and 1176 compressor. Drums from the DSI Tempest . 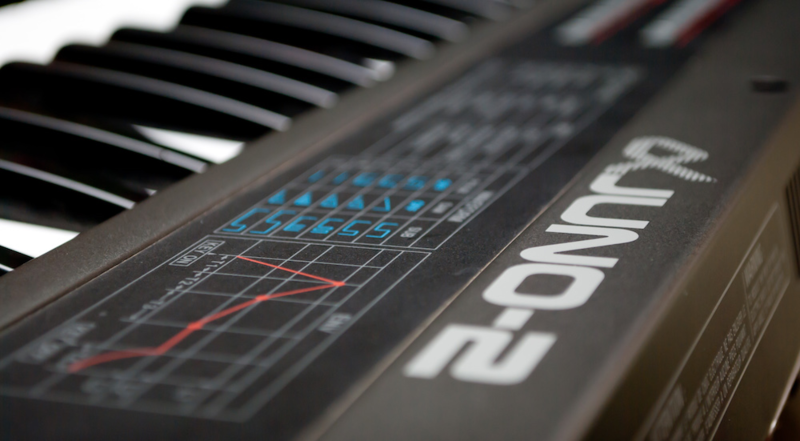 Pad from the Roland Alpha Juno 2 through Eventide H9. Snare with reverb from an old Dynacord reverb unit. Arp sequence is from the DSI * Tempest. The hi resonance feedback sound was made with the modular system. The Bass is from the Cwejman VM-1. days were dark are they light? Thanks for your ongoing support for me and my music! And to those who have gifted Steem, SBD, Commented, shared and voted on my new account! Thanks to my @helpie team for their continued support! Also thanks to @luzcypher and @pfunk for being amazing music champions for all of us musicians here that grace your Open Mic stage. And also, a huge thanks to @prc and the @dsound team for their continuous support for me and my music. It is all very much appreciated! 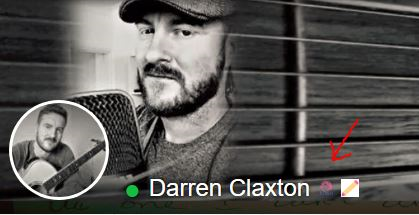 Darren Claxton is a Songwriter, Musician and Producer of his own music, from Derbyshire UK. The music he writes is often heartfelt acoustic indie folk with a sprinkling of rock and country influences, with an occasional world music flavour as heard on his track ‘Dragonfly’. But most of all, it’s his passive emotive thoughts and feelings that are delivered through that soothing vocal, and intricate guitar playing of his. I wrote ‘Waiting on a Rain cloud this morning, whilst eating breakfast! As I looked out onto the garden, I saw birds feeding, bees flying and plants growing! Here in England six weeks ago, it was a bitter -5c and bitterly cold. ‘Friends’ is a story about people that you knew really well, haven’t seen in a long time but thank for all the memories you made and now share. I’ve moved around a few times during the past 15 years and met so many interesting lovely people along the way, that I’d like to call ‘friends’. ‘I wonder what they’re doing now, I’d like to find it out somehow and would you’? This verse in the song really stays with me, as I feel we can all relate to that sense of “where are they now? What are they doing? and, I’d like to find out somehow”. 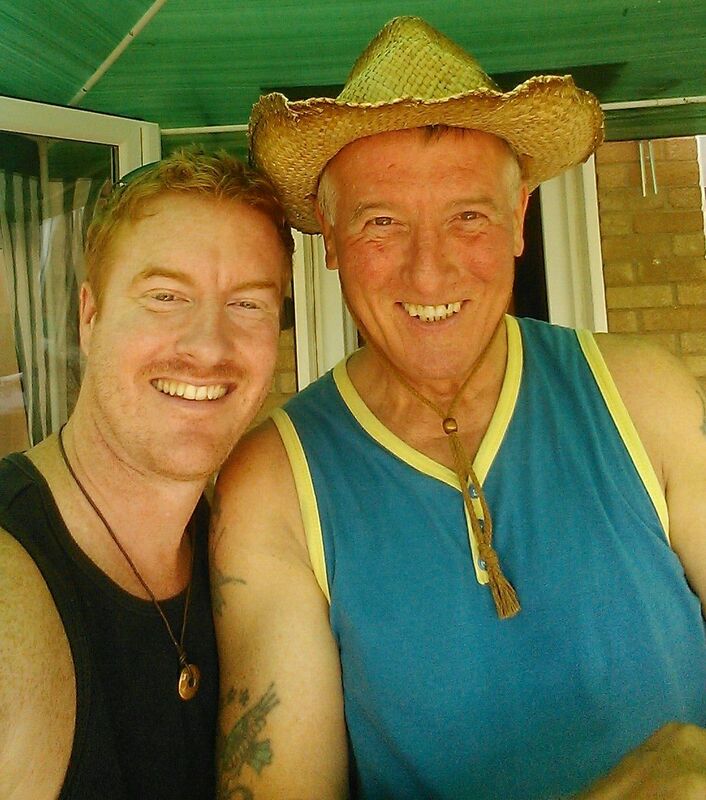 My best friend, My dad. The one who raised me and my sister since we were 7 and 4 years old, the one who keeps me sane and the one who’s my biggest music fan! Thanks for listening and supporting my music! I recorded it for week 80 but it somehow got missed by the great OpenMic bot! As I really put my heart and soul into it. Thanks as always to @luzcypher for this awesome brainchild of his! It really has opened so many doors for me as a musician and I’m no doubt others echo what I say. I look forward to seeing all the other great musician here this week. Nesecito La Playa – ‘I need the beach’ is my musical offering for the Steemit Music League Challenge S2:R8 Latin Music. I’m loving the challenges here which really gets my many musical juices flowing, because I don’t just write vocal songs you know? I have other sides to my creativity. I wrote this track a while back with images of Latin America and the beaches of Mexico and Brazil. I’m a huge fan of Santana’s early music like the classic album ‘Abraxas’ which kind of inspired this instrumental of mine. When I’m not singing, I like to use the lead guitar to convey my feelings. I hope you enjoy this Latin sounding tune for this week’s contest. Thanks to @chiefmappster and @prc for continously supporting us musicians here. Without kind people like yourselves, our community just wouldn’t be the same. Thanks for your support with my music! I’m steadily understanding the Stish protocol and how it will help to support me and my music in the future. With the popularity of Cryptocurrencies and impending doom of the once fruitful money cow that are the record labels, I’d like to offer my EP for sale here on Steemthat. SteemThat and Stish have gotten me very excited regarding the future development of my creative musical world. How great is it that we can sell something that others really love to listen to for a digital currency which can then be traded or sold? Musicoin is already doing that but it’s early days for this radical shift in digital sales and streaming. Stish would be a preferable method for me to help this platform grow and blossom! My music is now selling steadily on Steemit with my fans paying in STEEM or SBD through the direct download links that I create with each post. This is a very exciting time for me and many other quality musicians on the blockchains. I understand that, some users will obviously just go and download it for free, which is rather annoying but, I need to speculate to accumulate and I’m willing to take that chance. Music is my life, passion and therapy, and I write most days. I have so much more musical creations to produce and release here on SteemThat, Steemit, Dsound and Musicoin which will positivly promote and develop a good following, hence, enabling me to realise my dreams of musical success and self-actualisation. I wrote a post here on my Steemthat blog yesterday with direct download Dropbox links to my music. You won’t even need a Dropbox account to download! so what are you waiting for? Thanks for reading and please feel free to comment on my plans. ?Have You Heard My 5 track EP?? ‘Never Grow Old’ – Download it Now with – ? Steem or SBD ?- Directly from this post! Have you heard my 5 track EP ‘Never Grow Old’ yet? Have you downloaded it and played it loudly on your home or car sound system? Well, you’re missing out that’s for sure! The digital age has been truly revolutionary, and as a musician I’ve found it to be a priceless outlet for my music. I have now released the album on Bandcamp to generate some much needed funds to enable me to record more music in the future! Plus, us musicians have to eat you know! ? What I will do is place a DROPBOX link in this post for anyone who’d like to download it. This is on the understanding that they pledge and deposit a fair amount of SBD or STEEM into my wallet. It’s on sale at £3 GBP on Bandcamp which is roughly $4.20 USD – That equates to roughly 2.6 SBD or 2.7 STEEM, So without further adieu, MY EP is out NOW!!! Here’s the track listing and links where you can read more about each song. You can download the tracks individually if you prefer. Please donate what you can to my Steemit Wallet This will enable me to carry on producing more material. There will also be a rare opportunity to own a copy of the ‘Never Grow Old’ EP on CD which will be signed by yours truly. There’s only a very limited number of copies available, because they’re rather costly to produce! I can send these via Airmail if needs be, in a secured padded envelope, so they can reach you across the globe! ? I really really appreciate the support of this amazing community @stishit @steemit @dsound @dtube and @discord. ? All of the SMA and MSP Waves ? teams for playing my tracks live on air and everyone else who listens and supports me. To ALL of my @helpie family for just being brilliant human beans and keeping me positive!!! I’d also like to that the rest of this community that listen, comment, up-vote and share my music. And of course @mspwaves and @sma for letting me crash their radio shows and jam occasionally! Thanks for taking the time to read my post and for your continuos support of my music! Sometimes, all that’s needed is a voice and instrument. I welcome you to sit back, put those headphones on and embrace this brand new song of mine. Calm, down I’m feeling chilled! Restless, no one needs my help…. Thanks for your continued support and supportive words! All of my songs are recorded at home on my trusty old Zoom MRS 1608 – 12 track Porta Studio, which just demonstrates what you can achieve with limited recording equipment. I also write all of the music, lyrics and play all instruments that you hear. Oh I’ve been sitting here oh so long. It really has opened so many doors for me as a musician and I’m no doubt others echo what I say. I look forward to seeing all the other great musician here this week. I’ve also created a Steemthat Discord server for us to meet and chat in. Reflected In Your Eyes was written for my Open Mic entry this week. As ever, it was penned very quickly and improvised as I went along. After listening to again on Monday, I started to layer some other instruments, re sung the vocals and mixed it. This is always a rather speedy process as I’m a busy father of two little people, who like to burst through the door mid-vocal recording!! I then sent the rough master over to @d-vine who’s an incredibly talented producer, for her to master, bring out the dynamics and sprinkle some of her Devine production magic all over it. I’m sure you’ll agree that it sounds so much different to the original OpenMic entry, and coupled with @d-vine mastering touches, makes for a really catchy new track of mine. So if you’re an independent busy artist like myself, that would like some help with your tracks I totally recommend @d-vine to add that magical finishing touch to your tracks. Thanks for your ongoing support with my music. Here a stand is a track from the Zoom vault. It was written a few years ago and re-recorded especially for @dsound and @steemit. It tells a tale of those petty arguments we have with our partners. I hope you like this country vibe. Thanks as always for your support and for those of you that have now purchased the ‘Never Grow Old’ EP you’re really helping and supporting my future releases. Thanks is me and my better half in the photograph. Exciting Times!! My Brand New 5 Track EP is out now! ‘Never Grow Old’ by Darren Claxton on Bandcamp! The digital age has been truly revolutionary, and as a musician I’ve found it to be a priceless outlet for my music. So without further adieu, MY EP is out NOW!!! There will also be a rare opportunity to own a copy of the ‘Never Grow Old’ EP on CD which will be signed by yours truly. There’s only a very limited number of copies available, because they’re rather costly to produce! I can send these via Airmail if needs be, in a secured padded envelope, so they can reach you across the globe! I really really appreciate the support of this amazing community @steemit and @dsound @dtube and @discord. @prc gets a special mention for his ongoing championing of my music! Here’s one of my instrumental tracks called Primed. It’s an experimental mixture of guitar and percussion with driven upbeat vibes.